Hi I’m Mary-Ann from Liverpool and I’m a lover of dogs. I have two dogs myself who travel with me most days because they are my babies. I would be happy to offer your family friend a fresh start with a warm hydro bath followed by two shampoos, a conditioning wash, full blow dry and a cologne freshener. I can treat your dogs for fleas and ticks if needed but I can also offer you a great grooming service not just a wash. I will come to you in my enclosed trailer so your pet feels secure and treat them like they were my own. I service the surrounding areas of Liverpool up to Kemps Creek, Smithfield, and down to Campbelltown and Narellan. Mary-Ann is passionate about dogs and loves that she gets to spend every day washing and grooming them so they are happy and healthy. 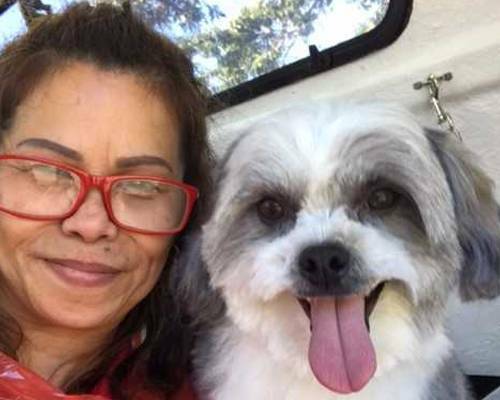 Mary-Ann services Liverpool, Ashcroft, Cabramatta, Bonnyrigg, Lurnea, Moorebank, Chipping Norton, Prestons and surrounding suburbs, so why not call her on 131546 to come and make your pooch look and smell better than it ever has. Jim’s Dog Wash services include two washes, a conditioning treatment, warm hydrobath, a blow dry and a cologne spray, leaving your dog smelling clean and fresh. We also provide a complete dog grooming service on a regular basis to keep your pooch looking its best at all times! Call Mary-Ann on 131 546 for a free quote and she will come to you in her enclosed Jim’s Dog Wash trailer which makes the dog feel safe and secure. Mary-Ann is here to offer you and your dog a professional service so call 131 546.